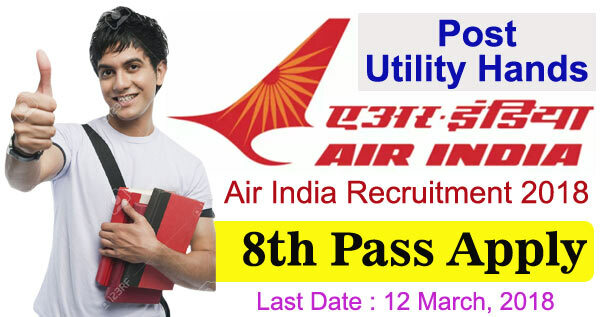 Air India Recruitment 2018 - Under Air India, there are 60 vacant posts for Utility Hands, for these posts desired and eligible candidates are invited online application. In respect of this recruitment, the vacant number of posts is 60. Some among the given posts as per rule are reserved for the candidates of different categories. The number of posts may decreased or increased. Starting date for online application registration is 24 February, 2018 and the last date for the application submission is 12 March, 2018. For more information as about total no. of posts, age limit, educational qualification, selection process, application fee, important dates, how to apply etc., regarding this recruitment visit the official website of Air India http://www.airindia.in. Education Qualification : Candidates should have passed 8th Class. More post -wise educational qualification details please go to the official notification. Age Limit : Candidates age limit should be Maximum 55 years. Upper age relaxation will be given to reserved category as per the organization norms. More details please go to official notification. Selection Process : Candidates will be selected based on Skill Test and Interview. How to Apply : Candidates Have to Log on to the Official Website of Air India Recruitment i.e, www.airindia.in. Then Search for the Application Form. Fill the Application Form With all the Required Details. Upload All the Required Documents. If Applicable, Pay the Application Fee. as per the Category. After Filling the Application, Submit the Application Form. Candidates have to Check the Application before Submitting it. Take a Printout of the Application Form for further Use. Postal Address : Office of Air India Air India Engineering Complex HR Unit, APU Centre NTA (New Technical Area), Dum Dum,Kolkata-700052.